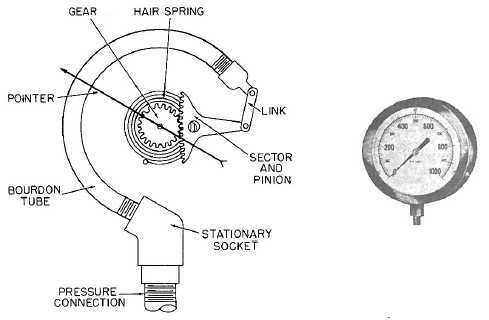 The invention of Bourdon Tube Pressure Gauge technology came about in 1849, when Frenchman Eugene Bourdon patented the design. Due to the fact that it was more linear, sensitive and accurate, it was accepted quite widely. In 1852, Edward Ashcroft bought U.S. Patent of Bordon’s design and he became a well-known gauge manufacturer. When Bourdon’s patents expired in 1875, Bernard Schaeffer of Magdeburg, Germany began to manufacturer Bourdon tube gauges via his company Schaeffer and Budenberg. Bernard Schaeffer also had his own proprietary gauge design which was quite successful at the time. A common factor amongst most tools that measure pressure is that the source of the pressure is the only necessary force needed to show a readout of static pressure. Generally speaking, these devices use an elastic chamber internally which turns pressure into motion. This is then fed through a variety of levers, links, and gears which cause a pointer to move along a scale to indicate the pressure detected. There are three kinds of elastic chambers which may be implemented in gauges: Bourdon tubes (which may be helical, c-shaped or spiral), single-capsule and multi-capsule stacks, and bellows. Manufacturers have been utilizing the Bordon tube design in a variety of ways, dating back to when this type was invented over 100 years ago. Bordon-tube gauges are now used for measuring an array of pressures including absolute, sealed, differential, and gauge. They are also used to measure vacuum pressure. The accuracy is between 1-1/2 inches to 16 inches for dial diameters, and up to 0.1% of span. Certain accessories may add further functionality and other benefits. A tube with closed ends and thin walls connects to a fixed pipe’s hollow end. This pipe holds the fluid pressure that will be measured. The closed end forms an arc when pressure is increased. A gear rotates from pressure that has been converted from the motion of the arc. A pinion gear in a small size is affixed to the pointer shaft which multiplies the motion due to the gear ratio. The pointer is calibrated by way of the initial position, the position of the pointer shaft, the location of the pointer in relation to the indicator, and the length of the linkage. This allows for a variety of pressure ranges to be measured by the Bourdon tube. Two separate Bourdon tubes can also be linked together in order to measure differential pressure. Bourdon tubes are intended to indicate gauge pressure in relation to ambient atmospheric pressure. This is different from absolute pressure. Reverse pressure will provide measurement of vacuum. The majority of Bourdon tubes use capsules or diaphragms, though there are aneroid barometers which use Bourdon tubes that have both ends closed. An orfice restriction often may be implemented to keep the gears from wearing down when the pressure is pulsing at a rapid rate. The orfice restriction also gives an average pressure reading. Glycerin or oil may be placed into the whole case, in situations where the entire gauge is exposed to continuous vibration of any kind.